Domestic Model of Audience Costs – When Can They Tie Hands? According to conventional wisdom, a leader's public commitment can help states tackle asymmetric information about resolve and intention, which is a major cause of conflict in international bargaining. This hinges on a strong assumption that citizens always politically punish a leader if (s)he reneges on the commitment. Relaxing the assumption, this study offers a domestic model that explains under what conditions citizens punish their leader, and when these punishments make the leader fulfill the commitment. In the model, voters form preferences based on not only whether their leader's actions match his or her words, but also what policy consequences the leader's decisions bring and how complex or salient the policy is to them. The study shows that citizens can both support their leader's backing down and punish following through. Given that, political punishments do not always deter leaders from backing down. In addition, comparative statics results show that citizens actually become more supportive of their leader as the issue becomes more complex or salient. Thus, the model suggests that a leader's public commitment might not help states overcome asymmetric information––and consequently avoid conflict––in international bargaining. 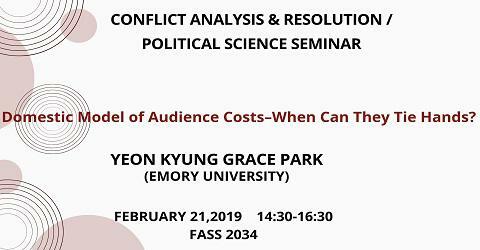 Moreover, the model's results suggest that audience costs do not always tie leaders' hands effectively, especially in sophisticated high-stake situations such as international crises––the very settings in which audience costs have been expected to be highly binding.